BASSETERRE, St.Kitts– The identity of the third young man accused of Leanna Napoleon’s murder has been revealed through a mug shot, showing yet again another baby-face accused killer, just like his two co-accused which includes the deceased’s brother. Police reported on Friday 23rd June that 18-year-old Ivan ‘Chinyman’ Phillip of St. Johnston’s Village was charged with the offence of murder. The young man surrendered to police on Wednesday 21st June after a Warrant was issued for his arrest two days before (Monday). 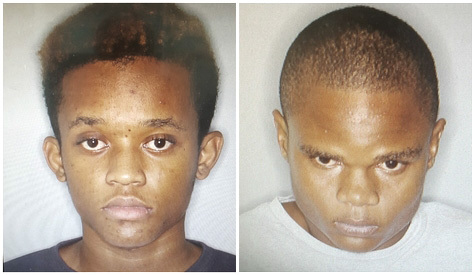 The dead teen’s sibling 19- year-old Brandon Lee Wells of Buckley’s Housing Development and 18-year-old Travien Liddie of St. Johnson’s Village were charged with the offence of murder on Saturday (17th June) and Monday (19th June) respectively. Initially, the police mug shots revealing the faces of Wells and Liddie created quite a controversial stir in the public as many people were shocked that such child-like individuals are being blamed for the gruesome crime. Napoleon, 17, was last seen alive publicly on Monday 8th May, had been missing for over a month until her dead body was discovered by police found dead and buried in the mountainous Olivees area overnight Wednesday 14th June. Reports from the local authorities indicated that Napoleon was in a shallow grave in the mountainous region of the Olivee’s area located beyond the Buckley’s community. Buckley’s Site was one of the two areas where she was last seen while the other area was Fort Street. Napoleon, who was a fifth form student of the Basseterre High School (BHS). Her death was the 15th recorded homicide for 2017 in the Federation.